This is my first lobster trip of the season on the Island Diver with the Divevets. Joining us on this trip was Donna the Biker – a recent transplant from Chicago (or is it Tennessee?) who has not been scared away by the bizarre antics of some in the group. This was Donna’s first lobster trip. I packed all my gear into my second game bag, and took one last look in my trunk before boarding. I didn’t realize I had turned my light off and left it in the trunk; thanks to Dan and a spare light that he had, my dive was saved. I would have went anyway with my secondary light, but that would have really sucked. Dan instructs Donna on the proper bagging procedures. Once anchored at our secret spot, I pushed others aside and was the first to jump in the water – I had to urinate really badly. 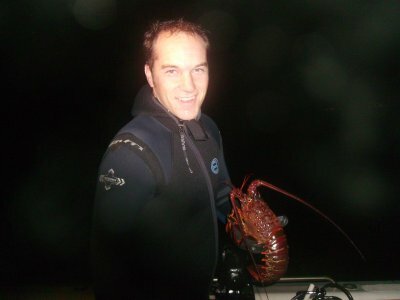 I submerged to 35 feet and started patrolling for lobsters to liberate. Many shorts were spotted, but I didn’t even bother grabbing them for practice. I had gone all the way to 15 feet before turning around; about 20 minutes into the dive, I finally grabbed my first legal bug in 30 feet of water. The water was surprisingly clear; an almost full moon was on the horizon peaking over the Palos Verdes hillside. I spotted another legal bug under the kelp, but missed the pin. I was the first back to the boat with my single lobster; others followed either skunked or with one or two. Jimmy the Bagman was lucky enough to run across a lobster hole and caught four. Jimmy the Bagman poses with one of his prized bugs. 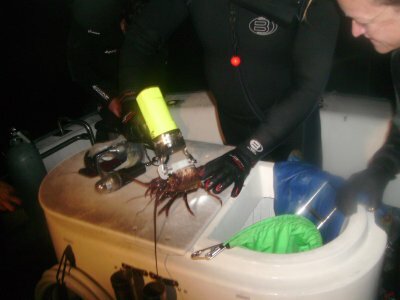 Dan shows Donna how to measure a lobster – of course this was already done in the water before it was bagged. We moved the boat to hopefully a “better” spot.